"Garden City encompasses 1 BHK, 2 BHK and 2 BHK deluxe homes that are designed to be spacious, well-ventilated & naturally well-lit. These affordable apartments come in Ground + 3 floors & Stilt + four floors summing up to 1356 housing units in 46 blocks. Garden city residential apartments is all set to offer simplified and specifically modeled apartments for middle class and upper middle class segment. 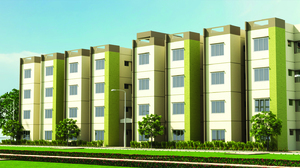 The 1 BHK (Grand), 2 BHK (Superior) and 2 BHK (Deluxe Homes) conforms to the norms of Vaastu. Here residents can enjoy better lifestyle, investors can gain good return on investment and senior citizens can live a worry-free life. Having built in a serene environment yet close to much sought after locations in the city it presents you a lifestyle that you have been looking for. Firm’s attention to details and workmanship is evident from beginning to end. The mall of Garden City to be the largest shopping destinations in Vedapatti to cover a humongous range of residential areas and business centers of Vadavalli, Veerakeralam, Gandhi park, Selvapuram, Perur, Kovaipudur and it’s neighborhoods."